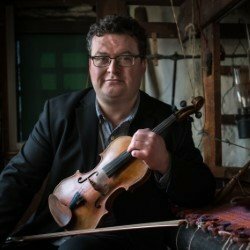 An afternoon concert series by one of Scotland’s leading fiddle exponents. Alastair’s heartfelt journey features a unique tribute to his fellow Ayrshire man Rabbie Burns alongside the magical melodies of 18th-century master Niel Gow and 19th-century virtuoso James Scott Skinner. An invigorating and soulful hour not to be missed. ‘There is a breathtaking effortlessness to Savage’s musical art: technical and intricate without ever overshadowing the music itself’ (Su O’Brien, BrightYoungFolk.com). ‘Panache, grace and affection’ (Jim Gilchrist, Scotsman). ‘The fiddle shows both sweetness and granite strength in Savage’s hands’ (Alex Monaghan, LivingTradition.com).